In 2015, Park City Ski Resort and Canyons resorts merged creating the largest ski area in the U.S. In all, the resort boasts 17 slopes, 14 bowls, 300 trails and 22 miles of lifts. Additionally the city is the main location of the United States' largest independent film festival, the Sundance Film Festival, home of the United States Ski Team, training center for members of the Australian Freestyle Ski Team, the largest collection of factory outlet stores in northern Utah, the 2002 Olympic bobsled/skeleton/luge track at the Utah Olympic Park, and golf courses. Some scenes from the 1994 film Dumb and Dumber were shot in the city. Outdoor-oriented businesses such as backcountry.com, Rossignol USA, and Skullcandy have their headquarters in Park City. The city has many retailers, clubs, bars, and restaurants, and has nearby reservoirs, hot springs, forests, and hiking and biking trails. In the summertime many valley residents of the Wasatch Front visit the town to escape high temperatures. Park City is usually 20 °F (11 °C) cooler than Salt Lake City, as it lies mostly higher than 7,000 feet (2,100 m) above sea level, while Salt Lake City is situated at an elevation of about 4,300 feet (1,300 m). In 2008, Park City was named by Forbes Traveler Magazine among one of the 20 'prettiest towns' in the United States. In 2011, the town was awarded a Gold-level Ride Center designation from the International Mountain Bicycling Association for its mountain bike trails, amenities and community. The area was traveled by the early Mormon pioneers on their journey to where they settled and built Salt Lake City. One of their leaders, Parley P. Pratt, explored the canyon in 1848. He was given a charter the following year to build a toll road through it, which was finished in 1849. The basin at the top of the canyon was good for grazing, and a few families settled there. Early on, the area was deeded to Samuel Snyder, Heber C. Kimball and Jedediah Grant. The settlers named it "Parley's Park City", which was shortened to "Park City" in the early 1900s. The first known discovery of ore in this area was by Colonel Patrick E. Connor, who instigated his men to search the area in bringing non-Mormons to the Utah region. 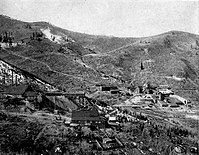 The finding of silver, gold and lead sparked the first silver mines in Park City in the 1860s. Park City's large mining boom brought large crowds of prospectors setting up camps around the mountain terrain, marking the first mining settlements. Although it was not the first find, the Ontario mine, discovered by Herman Buden in 1872 and later purchased by George Hearst, was the first major producer. By 1892 the Silver King Mine and its owners Thomas Kearns and David Keith took the spotlight as one of the most famous silver mines in the world. While silver was thriving in Utah, other mines around the world were depleted, drawing many of these miners to Park City. The town flourished with crowds of miners and wealth. However, the city nearly became a ghost town by the end of the 1950s because of a drop in the price of silver. The transformation of the town into a ski resort is primarily attributed to the silver need during and after World War I economy. The war and Great Depression were crippling the economy. Once the site of the largest silver-mining camp in the country, the town was virtually destroyed by fire in 1898. Tragedy struck again in 1902 when 34 miners were killed in an explosion in the Day West Mine. The mining community never fully recovered and the miners resorted to desperate measures. These desperate measures were based on the need to revive the economy, and in doing so the miners gave up their mining heritage, turning to the rising interest in the West and skiing. The silver industry was suffering severely, and the town was hanging by a thread when 'Parkite' miners presented to Utahns Inc. a proposal for a ski resort called Treasure Mountain which ended up saving the town. This ski resort opened in 1963 on 10,000 acres (40 km2) of land the miners owned with mineral rights. This is said to be when tourists first largely began to visit Park City. This marks the beginning of the ski industry largely promoted by the Utah State Legislation as a destination resort. Since the rise of the skiing and tourist economy, Park City houses more tourists than residents. It has become a place of fame through the 2002 Winter Olympic Games and provides more attractions than ever before. In the 1950s, Utah began to feed on Park City as a mountain getaway, and not until D. James Canon promoted winter sports in Utah, with the promotional scheme of "Ski Utah" and "The Greatest Snow on Earth" did many drive to see the city. Utah drew in over 648,000 tourists in 1970 and now a yearly average of 4 million tourists. In a small town with a population of 8,000, the average number of tourists in Park City is 600,000 per year. This significant increase in visitors could be credited to promotional material that is carefully planned and distributed by the Utah Publicity and Tourist Council. Growth has accelerated in the last few decades, and Park City is now one of the most affluent and lively resort towns in the United States. According to the Bureau of Economic and Business Research, in 2012 travel, tourism and recreation generated $7.4 billion in spending and $960.6 million in state and local tax revenue for the State of Utah. That same year Utah's total gross domestic product was $128 billion, making tourism 5.8% of GDP for the Utah economy as a whole. Park City draws in 3,006,071 average annual visitors; in the winter 1,603,775, and in the summer 1,402,296. Park City prospers from the average nightly visitor spending ranging from $100 to $350. Currently, Park City primarily relies on its tourist industry from skiing to restaurants to hiking and biking. The makeover of Park City has stimulated an entirely different culture of expenditure, adventure, and wealth, and their promotional material indulges it. As recently as the 1920s, miners in Park City were using underground trains and shafts to gain access to the mountain for skiing. Aerial trams once used for hauling ore were converted into chairlifts. To this day, there are still more than 1,000 miles (1,600 km) of old silver-mine workings and tunnels beneath the slopes at Park City Mountain Resort and neighboring Deer Valley. Park City might be a fairly nondescript-appearing town were it not for its colorful and evocative Main Street, where 64 Victorian buildings are listed in the National Register of Historic Places. There are many remaining mine buildings, mine shafts (most blocked off from outsiders with large steel doors), and hoists, including the weathered remains of the California-Comstock and Silver King Mines and the water towers once used to hydrate one of the biggest mines, the Silver King, provide a hint of the history of this mining town transformed in economic upheaval into a skiing resort. The Silver King Coalition mine was once the world's richest. Photo by Jack Boucher (1971). According to the United States Census Bureau, the city has a total area of 17.567 square miles (45.50 km2). None of the area is covered with water. Park City is located at the south end of Snyderville Basin and climbs steep mountains to the southeast, south, and west. 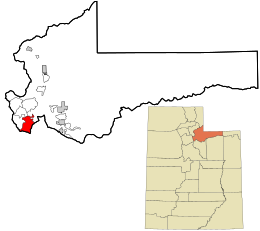 It is accessed by State Route 224 from Interstate 80 to the north and State Route 248 (Kearns Boulevard), which heads east to U.S. Route 40 and on to Kamas. Summers in Park City are warm with cool nights, while winters are cold and snowy. Park City has a humid continental climate (Dfb). According to estimates from the U.S. Census Bureau, as of 2016, there were 8,299 full-time residents in Park City. The racial makeup of the county was 78.8% non-Hispanic White, 1.1% Black, 0.1% Native American, 2.2% Asian, and 1.0% from two or more races. 16.8% of the population were Hispanic or Latino of any race. As of the census of 2010, there were 7,558 people, 2,885 households, and 1,742 families residing in the city. The population density was 430.2 inhabitants per square mile (166.1/km2). There were 9,471 housing units at an average density of 539.1 per square mile (208.1/km2). The racial makeup of the city was 81.0% White, 0.6% African American, 0.30% Native American, 2.1% Asian, 0.3% Pacific Islander, 13.5% from other races, and 2.3% from two or more races. Hispanics or Latinos of any race were 24.1% of the population. There were 2885 households out of which 26.8% had children under the age of 18 living with them, 48.4% were married couples living together, 7.3% had a female householder with no husband present, 2.6% had a male householder with no wife present, and 39.6% were non-families. Of all households 25.8% were made up of individuals and 5.0% had someone living alone who was 65 years of age or older. The average household size was 2.6 and the average family size was 3.03. The age distribution was 23.0% under the age of 20, 7.2% from 20 to 24, 30.7% from 25 to 44, 30.4% from 45 to 64, and 8.5% who were 65 years of age or older. The median age was 37.4 years. For every 100 females, there were 112.3 males. For every 100 females age 18 and over, there were 114.7 males. As of the census of 2000, the median income for a household in the city was $65,800, and the median income for a family was $77,137. Males had a median income of $40,032 versus $26,341 for females. The per capita income for the city was $45,164. About 5.3% of families and 10.0% of the population were below the poverty line, including 11.6% of those under age 18 and 6.6% of those age 65 or over. Park City operates its own free intra-city transit system (with additional service to limited areas of Summit County northeast of town). Routes include service to the Canyons Village, Deer Valley Resort, Empire Pass, Jeremy Ranch Park & Ride lot, Kimball Junction, Park City Resort, Park Meadows, Pinebrook, Prospector Square, Silver Lake Village, Silver Springs, Silver Summit/Highland Estates, and Thaynes Canyon. All Park City Transit buses are ADA accessible, however, there is also a paratransit service for those ADA certified passengers that are unable to use the regular service. Hubs (or transition points) include Canyons Transit Hub, Newpark (Kimballs Junction), Old Town Transit Center, and Park City Mountain Resort. In addition to the regular bus routes, there is a trolley that runs the length of Main Street and connects with the Old Town Transit Center (with connections to all other routes). Park City Transit has a Safe Haven Program where by all bus drivers have direct contact with the Park City Police Department. Anyone who is in imminent danger is encouraged to board any of the buses to obtain assistance. Park City Transit buses are only allowed to stop at designated bus stops, but the trolley may stop anywhere on main street. In addition to those routes operated by Park City Transit, two additional routes provide transportation from Salt Lake Valley through Parleys Canyon to Park City. These routes are referred to as Park City-Salt Lake City Connect or simply PC-SLC Connect and operated by Utah Transit Authority (UTA) through a cooperative effort of Park City Transit, Summit County, and UTA. Accordingly, the fare for these routes is about double the bus fare for regular UTA bus routes. Furthermore, UTA bus passes and transfers from UTA routes are not accepted. However, since Park City Transit routes are free, transfers from PC-SLC Connect to Park City Transit are not an issue. 663, 665 Mostly retired, Two were given overhaul and are intended to stay in Service. Park City High School is located at 1752 Kearns Blvd Park City, Utah. Park City School District's size is in the middle of the other Utah school districts, with more than 4,500 students. It is also close to the state average ethnic minority composition. Of its students 17% are ethnic minorities—mostly of Hispanic heritage. The school provides its students with a series of film and TV production classes, and hosts "The Miner Film Festival" each year for students to enter their films and show them at the Eccles Center. Steven Holcomb: U.S. Bobsled Team at the 2010 Winter Olympics and gold medalist in the 4-man bobsled event. Thomas Kearns: U.S. Senator 1883–1918, owner of Silver King Coalition Mining Co.
^ Giuffo, John (2011-04-12). "America's Prettiest Towns". Forbes. Archived from the original on 2011-08-15. Retrieved 5 March 2014. ^ "Park City (UT) Gold-level – International Mountain Bicycling Association". Retrieved 5 March 2014. ^ a b c d Rugh, Susan Sessions (2006). "Branding Utah: Industrial Tourism in the Postwar American West". The Western Historical Quarterly. Archived from the original on 2007-03-11. ^ McCord, Keith. "Utah tourism industry poised to hit $1B in tax revenue". DeseretNews.com. Retrieved 2016-03-20. ^ "Total Gross Domestic Product for Utah". research.stlouisfed.org. Retrieved 2016-03-20. ^ Moffatt, Riley. Population History of Western U.S. Cities & Towns, 1850–1990. Lanham: Scarecrow, 1996, 309. ^ "Subcounty population estimates: Utah 2000–2007" (CSV). United States Census Bureau, Population Division. 18 Mar 2009. Retrieved 10 May 2009. ^ "U.S. Census Bureau QuickFacts". U.S. Census Bureau. Retrieved April 29, 2018. ^ a b c d e f g h i j k "Meet the Utah athletes who will compete in the Pyeongchang Olympic Games". The Salt Lake Tribune. February 4, 2018. ^ "Park City's Alex Hall takes slopestyle gold in X Games". The Park Record. January 28, 2019. ^ "Eric Heiden, M.D." Heiden Orthopedics. Retrieved February 10, 2017. ^ Caple, Jim (February 10, 2017). "How Dr. Eric Heiden earned place among America's greatest athletes". ESPN. Retrieved February 10, 2017. ^ "For McRae Williams, the goal was never World Championships". The Park Record. February 1, 2019. ^ "Bradley Wilson U.S. Ski Team – Freestyle". US Ski Team. Retrieved February 1, 2019. ^ "Bryon Wilson". IDOne USA. Retrieved July 27, 2016. "Economic Profile: Tourism: Park City and Summit County Utah". Park City Chambers of Commerce, Convention & Visitors Bureau, 2009.